Southern Illinois University President Randy Dunn has named Randall G. Pembrook, PhD, as the ninth chancellor in Southern Illinois University Edwardsville’s history. The selection is pending formal SIU Board of Trustees approval, and Pembrook will officially assume his duties in early August. An official introduction and reception will be scheduled for the beginning of the academic year. Chancellor Search Advisory Committee Chair Gireesh Gupchup, PhD and dean of the SIUE School of Pharmacy, led the 21-person committee through the nine-month national search that began with 65 candidates. The committee comprised faculty, staff, students and alumni. Executive search firm Witt/Kiefer assisted the search committee in representing the president in the search. Pembrook has worked closely with the directors of Washburn’s Center for Community and Civic Engagement, Center for Teaching Excellence and Learning, Honors Program, Leadership Institute, Mulvane Art Museum, Office of International Programs, the KTWU Public Television Station, and the Washburn Transformational Experience Program. In the last five years, Washburn University has implemented over 15 new programs such as the doctor of nursing practice, master’s programs in accounting, addiction counseling, communication and leadership, health sciences, and law, as well as bachelor’s programs in entrepreneurship and innovation, environmental biology and forensics. “I am absolutely thrilled to be selected as the next chancellor of Southern Illinois University Edwardsville,” said Pembrook. “For me, it truly feels like coming home. I’m returning to my alma mater, which has grown significantly in national stature as well as student enrollment. 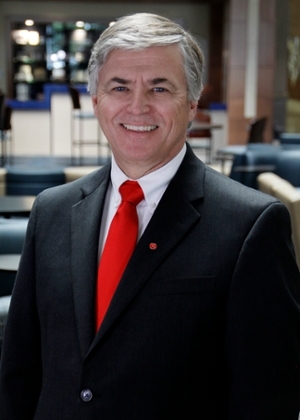 Before coming to Washburn, Pembrook served at Baker University for four years in several capacities, including executive vice president and provost, interim vice president for enrollment management, acting dean of the School of Professional and Graduate Studies, and special assistant to the president. He also has served as chief academic officer for Baker’s College of Arts and Sciences, School of Education, School of Nursing, and School of Professional and Graduate Studies. Before joining Baker in 2007, Pembrook was dean at the Conservatory of Music and Dance at the University of Missouri-Kansas City, where he also served as associate dean of the Conservatory, chair of the Music Education/Music Therapy Division, and Conservatory faculty chair as well as chair of a four-campus faculty committee reporting to the University of Missouri system president. A Metro East native, Pembrook and his wife Mary Jo have two daughters, Sarah and Rachel. “I will be within an hour of my home town and family in Greenfield and look forward to working diligently for the citizens of southwest Illinois, the state in general and the region to continue SIUE’s standing as a valued higher education partner,” Pembrook said. Pembrook succeeds Julie Furst-Bowe, who resigned after a three-year tenure to become vice president of instruction at Chippewa Valley Technical College (CVTC) in Wisconsin. Photo: SIUE Chancellor Randall Pembrook, PhD.